A good shrimp cocktail is one of my favorite appetizers. Clean and simple, it’s very hard to beat a good one. But, I rarely (okay – never) order them at restaurants mainly because they are ridiculously expensive for what they are. 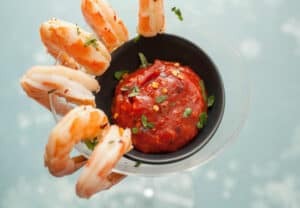 At home though, or on vacation, steaming some shrimp and serving them with a quick homemade cocktail sauce is one of my favorite things during a casual happy hour. This version relies on two things: 1) You have to not screw up the shrimp. Follow my perfect steamed shrimp instructions and you can’t go wrong. I don’t recommend boiling shrimp as they can quickly overcook. 2) Hunt and find gochujang Korean chili sauce. It’s in most grocery stores these days and any Asian grocer will definitely have it. This version is slightly spicier, but also slightly sweeter than a normal shrimp cocktail. It’s a nice change-up on a classic! A simple and easy switch-up to the classic shrimp cocktail. This version is served with a slightly sweet and spicy gochujang cocktail sauce! 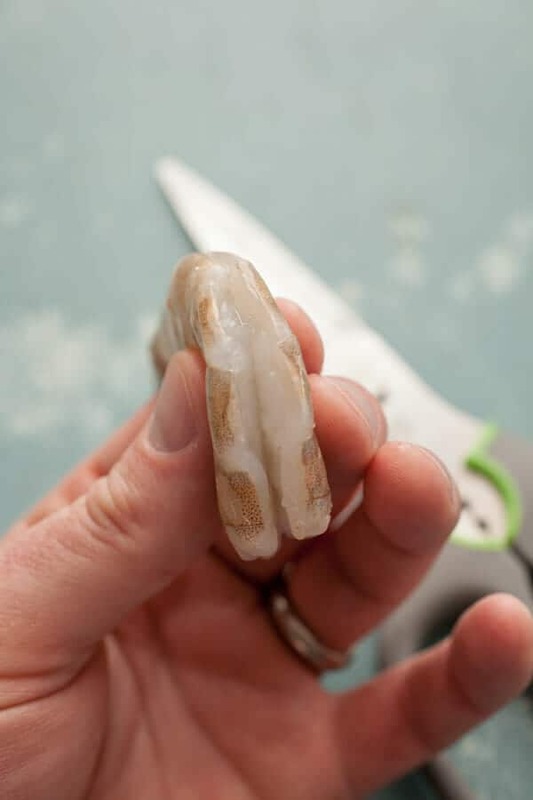 1) Use kitchen shears or scissors to cut up the back of each shrimp, exposing the vein if there is one. Rinse out any dirt or vein with cold water. Leave the shell around the shrimp though. 2) When all your shrimp are cleaned, toss them in a steamer and season them well with Old Bay. I recommend using about 2 teaspoons of Old Bay per pound of shrimp. A lot of it will fall off during cooking. 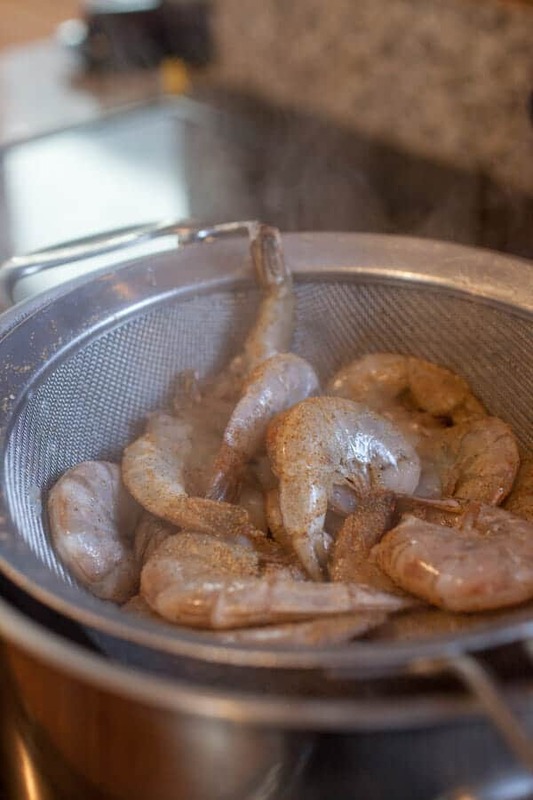 3) Add steamer with shrimp to a pot of simmering water. The water shouldn’t really touch the shrimp if you can help it. Let the shrimp steam for about 6 minutes until they are cooked through and tender. 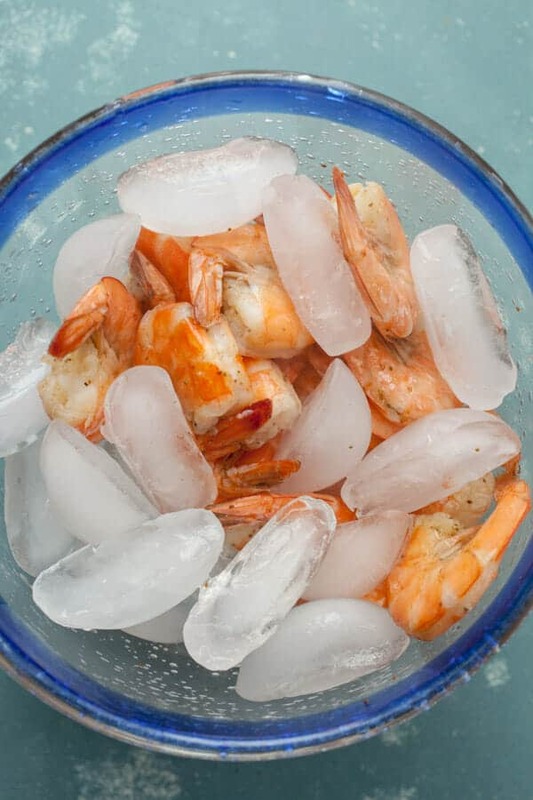 4) Chill shrimp in an ice bath and serve with homemade Korean cocktail sauce. (Ketchup, gochujang, ginger). 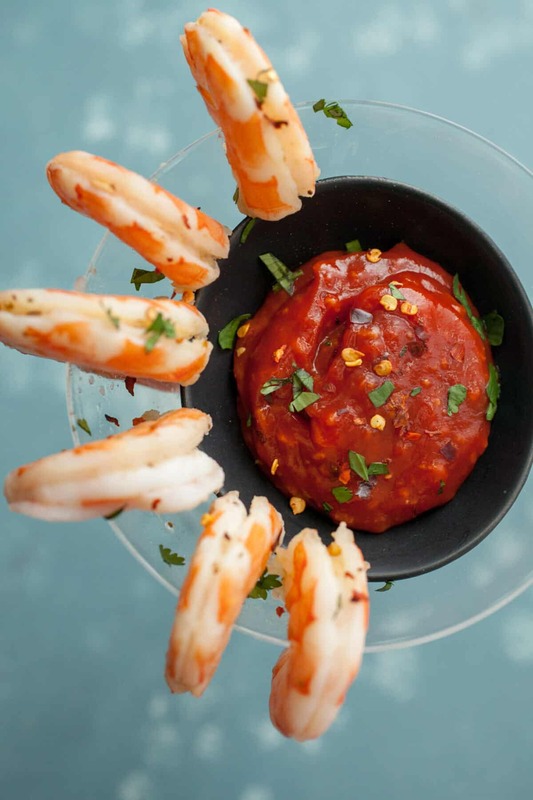 Garnish shrimp and sauce with minced cilantro and red pepper flakes. This is the stuff you must find. I found at my local grocery store, not a fancy market. It’s available these days. 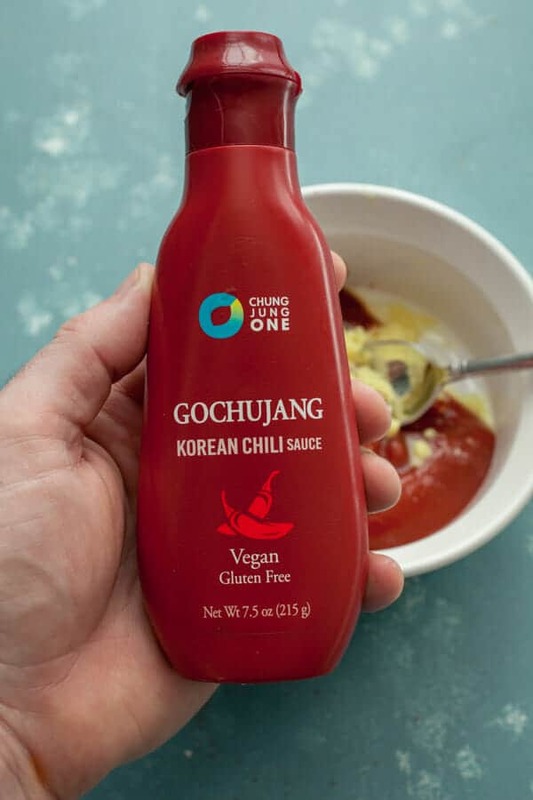 Gochujang is such an interesting chili sauce. It’s spicy but also sweet. It’s perfectly balanced and I find it to be SO addictive. 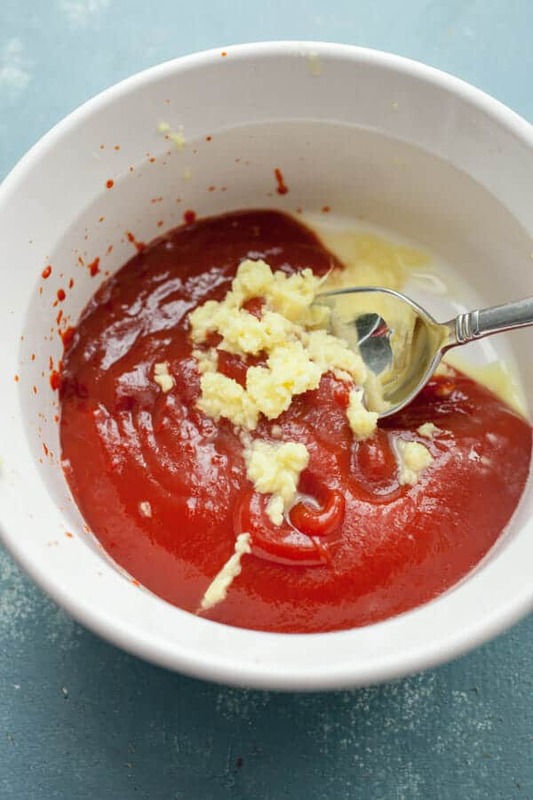 If you really can’t find it, you can substitute sriracha or chili garlic sauce with a pinch of brown sugar, but it won’t be exactly the same. Stir that together with ketchup, and very important, fresh ginger! Instead of horseradish it gives a nice bite and spice to the sauce. Don’t skip! Fresh ginger is the thing. Okay, let’s talk shrimp. Buy the big ones for shrimp cocktail. 18ish in a pound should be about right. I like to make sure I give everyone 5 shrimp per cocktail so maybe snag a few extra. Most importantly, don’t peel the shrimp before you cook them. The shell will help cook them slower and prevent overcooking. Just use some kitchen shears to cut up the back of the shrimp and clean out the vein. Then add them to a steamer basket (or I just use a mesh strainer) and season them liberally with Old Bay. Then add them to a pot wth simmering water and cover them! Depending on a few factors the shrimp will take somewhere between 5-10 minutes to steam. I realize that’s a big range so you kind of have to check on them occasionally and maybe give them a toss to make sure they are steaming evenly. When they are bright in color and firm, they are done. It’s not a bad idea to cut into one just to make sure. Once they are cooked, don’t rinse them but move them straight to a big bowl with lots of ice to chill them down as quick as possible. You can serve shrimp cocktail warm, but I prefer them chilled. I also like to shell the shrimp (but leave the tails on) before plating them. If it’s for a super casual thing though I’ll leave the shells on as well for ease. Serve each cocktail with a big spoonful of sauce and some fresh cilantro and red pepper flakes. This Korean shrimp cocktail is about as simple as classy can get! Who wants one?! Here are a few other Shrimp Ideas!